From September 2001 through to late 2004, Harry Charalambous and Anton Hamer, Directors of Plan Assist completed several property transactions together. In October 2004, Harry and Anton brought their businesses together in what was to be know as Plan Assist and by early 2005 there was an intention to secure an office space that the business could operate from. Harry and Anton set out to source a commercial property at a wholesale price and add value. The following case study details how they generated a massive 665% return on cash invested! Harry knew of the property that he had previously undertaken electrical work in that may have been for sale and so he approached the owner to see whether the owner would be interested in selling his property. After speaking to the owner it became evident that the property was in fact about to be put on the market and so Harry negotiated a win-win outcome for the purchase of this property which was to buy the property for $820,000 with a six-month settlement and access to undertake renovations during the settlement period. The set up of the property was a milk bar in the downstairs premises, with internal stairs to a two-bedroom unit upstairs, which suited the business owners as they were operating their business as well is living on site. During the negotiations it was mentioned that the rental market value of the property would be approximately $50,000, if it were to be leased as one tenancy. After exchanging on the purchase, extensive renovations were carried out to the property. These included a refurbishment of the downstairs area, removing and sealing off the internal stairs, refurbishing upstairs to be modern office space with unique entry and providing more parking on site. The total costs of the renovations were approximately $150,000. By the time we added in stamp duty and legal cost, we had invested approximately $1 million to purchase the property. During the renovation period and pre-settlement, we had local agents working to secure a tenant for the downstairs premises and secured tenants, ready to move in at the same time as we settled on the purchase, paying a rental of $1000 per week. Plan Assist then moved in upstairs at what was then a commercial rent of $20,000 per year, which gave us a gross rental of $72,000 per annum. 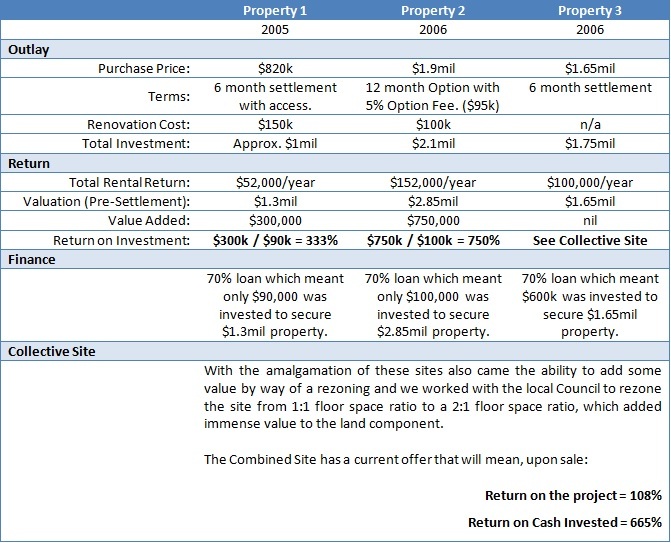 On the basis of the renovation works and the increased rental we received a valuation prior to settlement of $1.3 million and a loan of 70%, which was $910,000 and meant that we had invested approximately $90,000 to secure a commercial property of $1.3 million, which at that point was very close to neutrally geared. Once we had settled into this property we spoke to the vendor and asked him if he knew our next-door neighbour, as we saw an opportunity there to duplicate what we had already done. After contacting the neighbour and speaking to him in relation to his plans for the property, again we were told that this property had previously been marketed for sale however he wasn’t able to achieve the outcome he was looking for. Our first offer to him was to buy the property at $2 million, utilising a 12 month option and we offered a $10,000 option fee. This was not acceptable to the owner as he felt he needed a much more substantial sum to warrant taking the property off the market for a 12 month period. A second offer was to purchase the property for $1.9 million, still with a 12 month option however this time we offered a 5% option fee, which equated to $95,000. This was acceptable to the owner and we proceeded to have the document drawn up and we entered into an option to purchase the neighbouring property. At the time the ground floor of this property was set up as a Chinese restaurant and was rented to the owner’s brother at a very favourable rent of $600 per week plus (in the owner’s words) about a hundred dollars cash and a few meals a week. The top floor of this property was split up into three small commercial spaces that were leased to surveyors, engineers and a business broker, who were happy staying there however once again were on a reduced rate. With the ground floor space being 200 m² we saw an opportunity to add some value, by splitting that tenancy up into two retail spaces. One was 114 m² and the other 86 m². These two spaces were rented out as separate retail tenancies, achieving a net income of $500 per square metre which equated to $100,000 per year. The top floor was upgraded and rented out to a women’s health and fitness centre at $52,000 per year. With the improved tenants, long-term leases and increased return the property was valued at $2.85 million at the end of our option and prior to settlement. We had spent approximately $100,000 on refurbishing and upgrading the property during our option period. Once again we obtained a 70% loan on our valuation which meant we had approximately $100,000 invested in this transaction which was to pay the stamp duty, with a total investment cost of $2.1 million inclusive stamp duty and the $2 million loan from the bank. We then went on to repeat the same exercise with our neighbours on the other side of our original property, however this property had been maximised as far as the tenancies went and it was more about securing the property and improving a couple of the tenancies as well as expanding our office upstairs. The final property was secured at a price of $1.65 million with an ongoing rental of approximately $100,000 per annum. Having amalgamated the whole site then you have something that is much more attractive to developers, with only one owner for them to deal with rather than three. With the amalgamation of these sites also came the ability to add some value by way of a rezoning and we worked with the local Council to rezone the site from 1:1 floor space ratio to a 2:1 floor space ratio, which added immense value to the land component. There has been a great deal of developer interest in the property and the future intention is to sell the site to a developer, who is keen to amalgamate with a larger site next door.